Ancho fish tacos are rubbed with spices and grilled rather than battered and fried. Then they’re tucked inside corn tortillas and smothered with a creamy slaw. So easy. So healthy. So something we want to make again and again and again. 1. In a small bowl, stir together the mayonnaise, 1 tablespoon of the chipotle in adobo, lime juice, and garlic. Taste and add more chipotle if desired. Cover and refrigerate until ready to serve or for up to 1 week. 2. In a large bowl, whisk together the vinegar, oil, salt, and pepper. Add the cabbage, cilantro, and scallions and toss to coat. Taste the slaw and adjust the seasoning if needed. Cover and refrigerate until ready to assemble the tacos. 3. Preheat the grill to medium-high or 350°F to 400°F (180°F to 200°C). 4. In a small bowl, stir together the ancho chile powder, salt, pepper, oregano, and cumin. Rub both sides of the fish with oil, then rub the chile powder mixture evenly over both sides of the fish, pressing it gently to adhere. 5. Dab a paper towel with a little oil and, using tongs, carefully wipe the grill grate with the oiled paper towel. Grill the fish, closing the grill lid, for 4 to 6 minutes on each side. [Editor’s Note: We found that 5 minutes on the first side and 4 minutes on the second side tended to work pretty darn perfectly.] Transfer the fish to a plate and cover with foil to keep warm. 6. Before you turn off the grill, toss the tortillas on the grill grate, working in batches if necessary, and leave them there just until warmed through, 10 to 20 seconds on each side. Wrap the tortillas in aluminum foil or place them on a plate and cover with a towel to keep warm. 7. When you’re ready to sit down to fish tacos, grab a fork and break the fish into bite-size flakes. Heap them on the grilled tortillas along with the slaw, chipotle mayo, and cilantro and set out some lime wedges on the side. 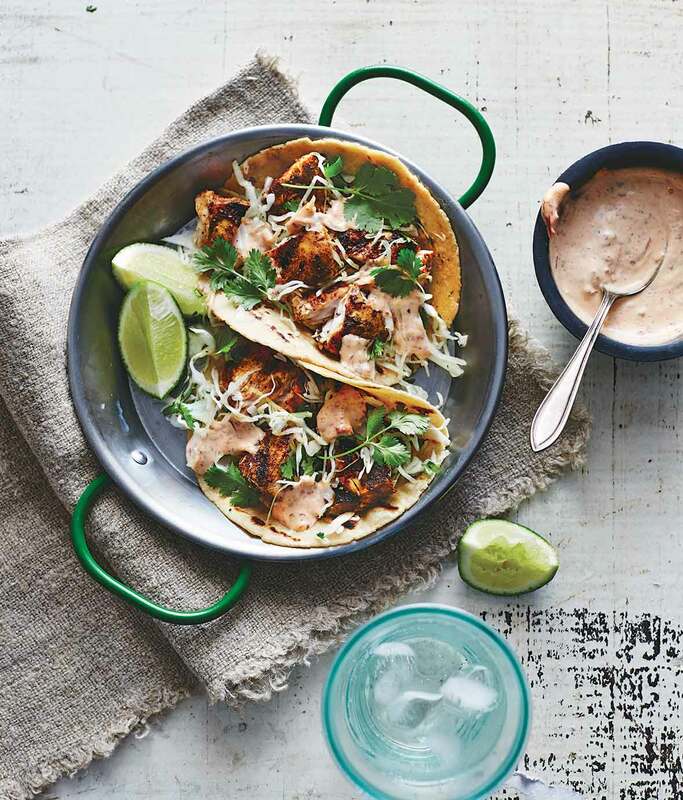 Ancho Fish Tacos Recipe © 2017 Southern Living Magazine. 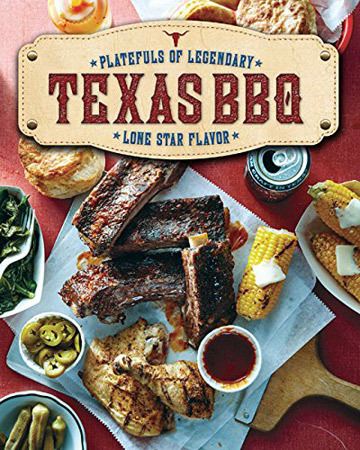 Photo © 2017 Time Inc. Food Studios. All rights reserved. All recipes and photos used with permission of the publisher. These were some seriously awesome fish tacos! Between the spicy fish, the tangy slaw, and the creamy mayo, this made for a perfect taco...or 3. The slaw came together quickly and seasoning was perfect for my taste. I made it about 1 hour ahead of time and refrigerated it. There was just enough rub for the fish. (I used cod.) I didn't have a grill basket but had no issues with the fish sticking on my oiled grill. I found the fish to have a pleasant level of heat to it but the mayo wasn’t really spicy at all. I'd add more chipotle in the future. This is a fabulous dish—full of fresh, zesty flavors and a big hit with my whole family. In fact, my daughter has named it one of her absolute favorite meals! The quantities for the slaw were bang on. Despite my initial fear that there was too much vinegar to olive oil, it tasted lovely. I made it about an hour before serving, and the wait seemed to help the flavors mingle and enhanced the dish. For the tacos, I used 1-inch-thick cod fillets, which required slightly longer cooking than specified in the recipe—maybe 6 to 7 minutes per side on the grill. They did stick (despite oiling the grill first) but they didn't fall apart and it didn't cause too many problems other than the grill requiring a good scrub and high heat afterwards! There was enough rub for the quantity of fish specified, but the recipe only served 4 of us and we could (probably rather greedily!) have eaten more as it was so delicious. The chipotle sauce required a little seasoning and I added an extra squeeze of lime juice. The result was spicy and smoky but zesty and worked perfectly with the fish and slaw. I have friends for dinner this coming weekend and will be braving the British weather to grill outside just so I can wow my guests with these divine fish tacos! These ancho fish tacos remind me of dinner out at a new local fish restaurant I've been to on the Northwest Coast. Plated, this meal looks so splendid with color—what other meal is so festive with greens and the purples? Scallions, cilantro, and cabbage. It pleases the eyes with their springlike colors. The chipotle dressing has a wonderful refreshing burst of lime with the kick of chipotle that’s not overly spicy or hot but a perfect complement to the rest of the dish. I made this a paleo dish with a large romaine leaf in place of the tortillas. My fish fillets were mahi-mahi. I added 1/2 teaspoon more salt to the slaw, but I like things a bit more on a salty side. The amount of rub for the fish came out perfectly! Timing on the grill was perfect at 5 minutes on each side. I didn't use a grill basket, we sprayed olive oil on the grate before warming up the grill and we didn't lose any of the fish. For the spicy chipotle mayo, once I stirred up all the ingredients, it looked chunky and I wasn't sure I wanted the texture of chipotle seeds in the sauce, so I whirled it all in the blender and loved the smooth texture of it. These ancho fish tacos are a fantastic summer dinner—substantial enough to be satisfying yet still light! Great flavor without being too spicy. Can't wait to grill these fish tacos up again. My fish fillets were smaller (4 ounces versus 6 ounces) so I had to use 6 fillets to get the 24 ounces of fish needed. With the extra surface area I needed extra oil for coating the fish after patting them dry. I ground my own ancho chile from dried in my spice grinder and I skipped the seeds. It still had a bit of heat but wasn't spicy. I would leave some of the seeds in next time. There was enough spice blend to give all fish a light coating. I think the flavor would have been better (stronger) if I had the larger cut fillets and only 4 of them as opposed to the 6 smaller cuts. The final fish was a little light on spices and salt but by no means bad! I wish the coleslaw had a bit more acid, either more vinegar or some lime juice. I grilled the fish on a wire screen so I didn’t have any issues of fish through the grill grate. I wish the mayo packed a little more chipotle punch. The tortillas were warmed on the grill. This could comfortably serve 6 people with 2 tacos a piece. Overall, these fish tacos were really good! I thought the flavor was really nice and didn't overpower the fish but I would use a bit more spice rub next time. I added a little fresh avocado and some fruity hot sauce sprinkled on top to zippy it up a little. I will definitely be making these again! If you like fish tacos, this ancho fish taco recipe is a winner. Perfectly balanced recipe. Meat definition is the flesh of an animal used as food. It’s not a meatless Monday possibility. Jesbee, my apologies, you’re completely right. I guess that’s the Catholic in me being brought up on Fish Fridays thinking seafood didn’t count as meat. I’ve amended the recipe so that it no longer reflects meatless Monday. Thanks so much for drawing our attention to this and I do hope you try the recipe at some point, whether on a Monday or otherwise.